We love to inspire you with some real life examples and a how to make it happen. Interested? Drop us a line at filip@joined.be. Some teaser to get your brains spinning! Feel free to share the experience! 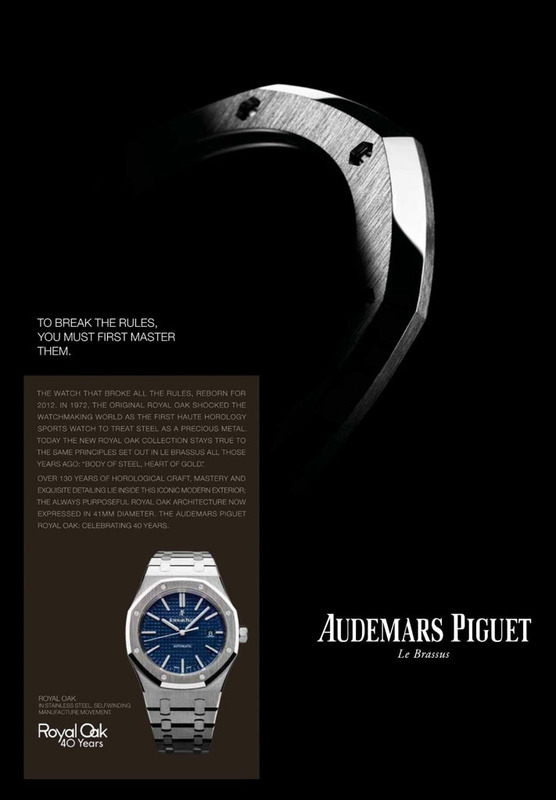 The headline of a campaign by Audemars Piguet, a luxury watchmaking took my attention. It struck me as a truth. But then again: In a world of disruptive change: is it really true? The question is: Do you need the know your existing business to be able to change it? To actually change it: Yes! You cannot go from A > B without knowing the A. But typically, the more you know your business, the more you are conditioned to come up with the ‘existing answers’, so your definition of the outcome, your point B will be mediocre at best. It takes real visionary leadership, a lot of listening, open-mindedness and guts to define a truly disruptive B. So to go from A to B in a successful way, don’t be afraid of blending your knowledgeable (but open-minded) experts with people from ‘the outside’ and some true leadership to make it a great cocktail. Project sheets – The elevator speech for your projects. I had to explain a bunch of small project streams from a company wide program to stakeholders. As those stakeholders all have their own specific focus, they tend to have a short attention span when it comes to the elements that are not really linked to their business. It’s however key to get their commitment on the program and the individual projects, so I made a quick project one pager. A little like the personal elevator pitch of your project. Feel free to use it to make your own projects more tangible! Share if you like. Kudo’s for the icon designers! Connecting others… it’s what networking should be. It’s not about connecting yourself directly. It’s about building up trust, credibility or any other form of social currency by giving others the gift of your network. Plain old sharing a business card you received from that great designer just when you’re colleague just lost his regular designer. Sharing that inspiring blogpost with your co-worker. Give a book to a good friend for fun or work. Make an acquaintance discover TED. Introduce a friend to friend. Tell about the things you love. When have you connected others? Working within and with a marketing team typically means working with always changing stakeholders (every project is different), a lot of young and eager people, a lot of overloaded decision makers, continuously changing market demands,… All the things that make business life lively. You have to love it, but this also means that quite some time is spend on aligning people, on planning, follow up, sharing information, status meetings,… This all seems like typical project management stuff and there is quite some research on that: what works and what doesn’t. However, in a typical project resources are committed to one scope, where’s in business reality today, you tend to be more in a web of different ‘projects’. Question there is: How to bring in the knowledge from project management without bringing in the heavy methodology and tools that might work in a large project setting, but nog in various day to day interactions? Doing some investigations on how multidisciplinary teams can work more efficient together when not being in one great project, I learned some things. extreme choice (as in: whatever solution you choose, push it hard and force yourself to put as much in it as possibel) has some advantages (don’t use multiple ways of communication). one exception: face 2 face can (and should) always complement the communication method/tool you use. as always, people and their belief in the process & the use of the tools define the outcome. I am now experimenting a lot with Trello combined with some sort of weekly (and in some periods daily) kind of stand-up meeting to get all our campaigns, strategic work, projects,… done. What works well for you and your team? The real question is: if you are forced to choose, what do you do? or do you want to be the first with a new idea? Probably, there is no right answer, as it al depends on the situation. If you are a start-up, you want to go HARDER: taking more customers with your one product/service you are build upon. But when in doubt, the smartest way is probably to go for FASTER. Getting towards the market faster gives you either more revenue and margin/EBIT, or it gets you to failure more quickly. Which enables you to learn, adapt en beat the competition that has not yet failed but is loosing touch points with their existing audience. Challenging the status quo: ready to create value for your business. New site up, taking things to next level with you. Feel free to have a look at the things we do, read and comment away at our blog. Interested in what value we can bring together with you? Give us a ring! What gives you Energy? Or probably even better: what gives you a true emotion? It is about your Market (what you do) , your Customers (who you do it for) and let those two Communicatie with on and other. If you try to do everything, you don’t have a market, you have a garbage. If you try to do well for everybody, you will get tired very quick. If you cannot bring the added value to your customer, you are actually… well not creating any value at all. So go bring some creative value out there! There is a lot to say about Social Media in Marketing meetings, among CMO’s and even in the boardroom. But if everybody seems to be willing to ‘share’ with their customers, why is it so hard then to start sharing within your organization? It is amazing how little people do know about what their colleagues are doing. Maybe it is an obsession on everybody’s own scope and the recognition that comes with a internal network that took 15 years to build? The opportunities that are wasted because every person, team, business unit,… is only sharing information on successes (so when the work is done) are enormous. Just imagine what could happen when today you see that the guy from finance you never met is working on a solvency analysis of a newcomer in the market whilst you are working on a commercial competitive analysis for your sales manager? Or to see that the guy from R&D picked up an idea you had 6 months ago and have developed already a little bit further in your spare time? Or you inspire a co-worker with the market research you did? An internal social network is technically no work at all. Start doing it. (Yes, we can help you ;-)). Information sharing is becoming a default setting. Sharing information, from your personal status (J-Lo is Single) to your work-status (P-Diddy is working on a segment strategy for oversea business) is becoming a natural way for Generation Y and below. I received a new-years wish from LinkedIn telling me which of my connections changed jobs. Change is not only way of doing business, it is only communicated openly. As it is important for youngsters to learn how to deal with the negative side-effects of this evolution, it is important for companies and teams to learn and even leverage this new behavior. Companies were restricting for years: restricting access to certain documents, restricting access to buildings, restricting access to people. Not only is this behavior making employees feel like infants, it is also very short-sighted. It is not only in the service industry that knowledge = power. Your company’s major asset are not your employees, but the knowledge and interactions they share with the rest of your organization. Share your wealth internally, it will bring all your employees to a higher level… of both happiness and productivity.